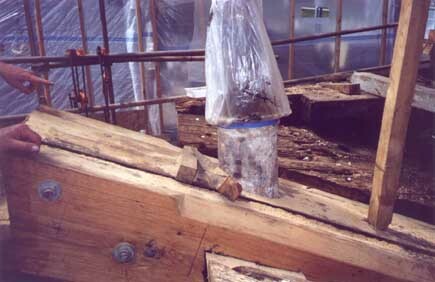 Rim Timber in Shop: The rim timber was the most complex timber in the entire rehabiliation. It is upside down in the photo. Two of the three pieces of the complete rim can be seen here. 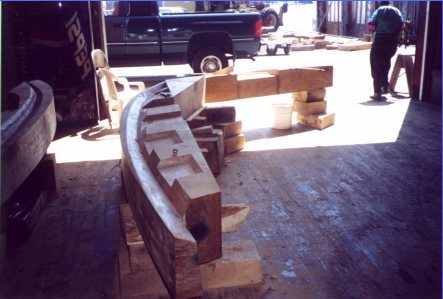 Note how the rim timber is curved, rabbeted to receive the hull planking, and has square cut-outs to receive the top of after frames. The depressed notch in the upper piece (below the stop lights on the pick-up truck) sits on the horn timber at the stern of the tug. The triangular piece can be seen at the transition from the aft piece (top of the assembly) and the port side (left side of the photo). Stern View Looking Up: Looking up at the stern, the new hull planking ends at the rim timber, which is now in position, supported on the horn timber and by the new stern frames. 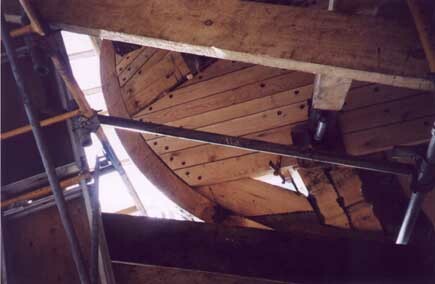 The horn timber can be seen towards the top, running diagonally up to the right side. An after frame can also be seen in the lower-right corner of the photo, with its double-sawn construction. Horn Timber Detail: The extreme end of the horn timber has progressed to the point that it is ready for planking and framing. The rudder stock can be seen going straight through the horn timber. New frames will be attached to the horn timber on both sides. 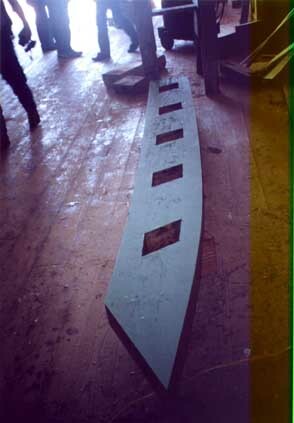 enlarge Covering Board in Shop: This is a covering board, which is the extreme outer plank of the deck. It fits over the vertical stanchions and the carefully cut squares are for that purpose. The board has been painted with primer to protect it and slow drying and cracking (called "checking"). The holes are carefully laid out using a pattern that is made on the deck of the tug to assure a perfect fit. 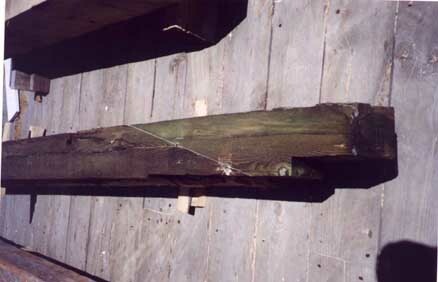 Deck Beam Scarf: This deck beam was removed from the after stern deck and repaired off the Luna. The thin white diagonal line marks a scarf, which replaces the rotten end of the beam with a fresh new one. Epoxy glue and bolting are used to make the connection.